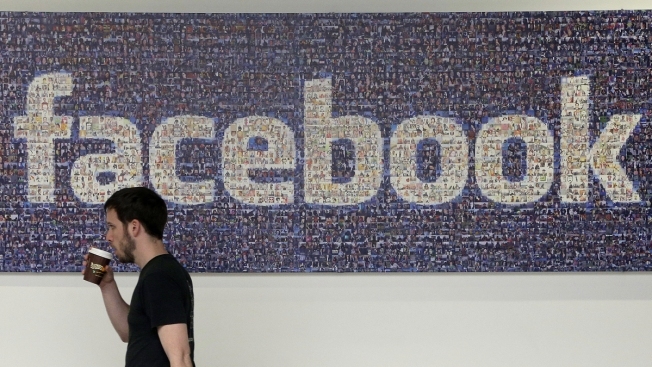 In this March 15, 2013, file photo, a Facebook employee walks past a sign at Facebook headquarters in Menlo Park, Calif.
A British parliamentary committee on Tuesday summoned Facebook CEO Mark Zuckerberg to answer questions on fake news as authorities step up efforts to determine whether data has been improperly used to influence elections. The request comes amid reports that a U.K.-based company allegedly used Facebook data to help Donald Trump win the 2016 presidential election. The company, Cambridge Analytica, has been accused of improperly using information from more than 50 million Facebook accounts. It denies wrongdoing. The chairman of the U.K. parliamentary media committee, Damian Collins, said Tuesday that his group has repeatedly asked Facebook how it uses data and that Facebook officials "have been misleading to the committee." "It is now time to hear from a senior Facebook executive with the sufficient authority to give an accurate account of this catastrophic failure of process," Collins wrote in a note addressed directly to Zuckerberg. "Given your commitment at the start of the New Year to 'fixing' Facebook, I hope that this representative will be you." Meanwhile, Bloomberg cited an anonymous source in reporting that the U.S. Federal Trade Commission is investigating whether Facebook violated the terms of a 2011 settlement that required the company to take steps to ensure that consumers give consent before their information is shared. Facebook is having an all-hands staff meeting Tuesday, a representative told NBC News. Its stock was down more than 5 percent in trading Tuesday morning, the second day it slid amid the controversy. The request to appear before Parliament comes as Britain's information commissioner said she was using all her legal powers to investigate the social media giant and Cambridge Analytica over the alleged misuse of data. Commissioner Elizabeth Denham is pursuing a warrant to search Cambridge Analytica's servers. She has also asked Facebook to cease in its efforts to pursue its own audit of Cambridge Analytica's data use. "Our advice to Facebook is to back away and let us go in and do our work," she said. 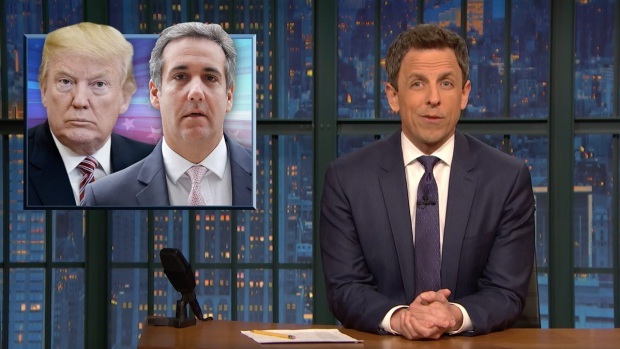 Seth Meyers takes a closer look at President Donal Trump directly attacking special counsel Robert Mueller in the Russia investigation and Facebook's massive data breach. Cambridge Analytica said it is committed to helping the U.K. investigation. However, Denham gave the firm a deadline to produce the information she requested — and it failed to meet it, her office said. Denham said the prime allegation against Cambridge Analytica is that it acquired personal data in an unauthorized way, adding that the data provisions act requires platforms like Facebook to have strong safeguards against misuse of data. Chris Wylie, who once worked for Cambridge Analytica, was quoted as saying the company used the data to build psychological profiles so voters could be targeted with ads and stories. The firm found itself in further allegations of wrongdoing. Britain's Channel 4 used an undercover investigation to record Cambridge Analytica's chief executive, Alexander Nix, saying that the company could use unorthodox methods to wage successful political campaigns for clients. He said the company could "send some girls" around to a rival candidate's house, suggesting that girls from Ukraine are beautiful and effective in this role. He also said the company could "offer a large amount of money" to a rival candidate and have the whole exchange recorded so it could be posted on the internet to show that the candidate was corrupt. Nix says in a statement on the company's website that he deeply regrets his role in the meeting and has apologized to staff. "I am aware how this looks, but it is simply not the case," he said. "I must emphatically state that Cambridge Analytica does not condone or engage in entrapment, bribes or so-called 'honeytraps', and nor does it use untrue material for any purposes." Nix told the BBC the Channel 4 sting was "intended to embarrass us". "We see this as a co-ordinated attack by the media that's been going on for very, very many months in order to damage the company that had some involvement with the election of Donald Trump," he said. The data harvesting used by Cambridge Analytica has also triggered calls for further investigation from the European Union, as well as federal and state officials in the United States. Bloomberg cited an anonymous source in reporting that the U.S. Federal Trade Commission is investigating whether Facebook violated the terms of a 2011 settlement that required the company to take steps to ensure that consumers give consent before their information is shared.